Another Season to Enjoy the Beach! Moonshine Beach at Table Rock Lake is one of the most beautiful summer vacation spots in Branson that gives visitors the opportunity to enjoy a relaxing getaway under the moon and the stars. The vast area of Moonshine Beach is perfect for people who want to enjoy exciting activities and water sports adventures. The great outdoors along the lake are some of the reasons why many visitors flock to this place during summer season. The clean and crystal clear waters of the pristine lake and lakeside trails are some of the outdoors in Branson that you should take advantage to enjoy the summer breeze of the season. At Moonshine Beach, you will get to enjoy many kinds of water fun activities such as swimming, fishing, boating, and many other water sports adventures. This beautiful vacation spot in Branson has a nice recreational facility maintained by the U.S. Army Corps of Engineers where you can get to enjoy a sandy beach in the Ozarks region. Beautifully located on the cove on Table Rock Lake, this largest sandy beach in Missouri is minutes away from the Dewey Short Visitors Center and the Shepherd of The Hills Fish Hatchery. The beach has a large pavilion, picnic tables, showers, flush toilets, food vendors, playground for kids, and a boat launch ramp. It is open from 9:00 am to 9:00 pm and requires only $5 fee for every carload. The beach also has a spacious recreation area located along the shores of Table Rock Lake. Unlike many resort facilities at the campgrounds around the lakes, Moonshine Beach is large that makes the visitors enjoy as if they are at the ocean beach. This beautiful beach on the lake has a beautiful body of clean and crystal clear waters that are surrounded by forested areas with hickory and oak trees. The great outdoors in the area where you can spend great recreational activities and water sports adventures on the clean waters on the lake are some of the most popular fun activities enjoyed by visitors. 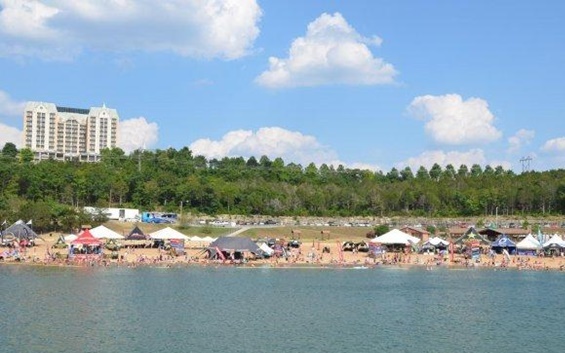 Swimming on the clean and cold waters of Table Rock Lake during summer season is one of the first water activities to do by water sports enthusiasts at the Moonshine Beach. If you want to add energy or want to explore more after spending a relaxing day at the beach, take a nice hiking at the paved path located near the Dewey Short Visitors Center. You can also take a hike at the Table Rock Lakeshore Trail that stretches 2 miles long and runs up to the Table Rock State Park Marina. Whether you want to soak up on the cold waters of the lake or take a great hike on the paved trails around the area, you are sure to enjoy the great outdoors on the lake. So, if you want to experience a relaxing summer vacation on the largest sandy beach in Missouri, visit the Moonshine Beach on Table Rock Lake in Branson and enjoy countless of recreational fun activities and other water sports adventures.